16 year old Malala Yousafzai accepts Anna Politkovskaya Award from 104-year-old human rights defender, Sir Nicholas Winton, known as “the British Schindler”. RAW in WAR (Reach All Women In War) celebrates the courageous and inspiring work of Malala Yousafzai, the brave young woman from Pakistan who has spoken out about the right of every girl and every boy around the world to receive an education. Defying the strict ban imposed by the Taliban on girls attending school, she refused to be silenced in the face of grave danger, just like Anna Politkovskaya did. Malala Yousafai was only 15 years old when she was shot by the Talican on 9 October 2012 for campaigning for education for girls. Ahead of the anniversary of Anna Politkovskaya’s murder on Monday 7th October, RAW in War honours Malala with the 2013 Anna Politkovskaya Award for her courage to speak out when nobody else dared, for her strength to give a voice to the many women and girls whose voices cannot be heard, and for her passionate belief in promoting education for girls. 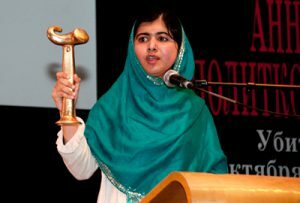 The RAW in WAR Nominations Committee for the 2013 Anna Politkovskaya Award was deeply humbled by the bravery and courage of Malala and by the determination with which she continues to campaign for girl’s education, despite the threats she faces. She lives a life of courage and truth-telling in the face of grave danger, as Anna did. Anna Politkovskaya was a journalist in her forties, when she wrote against human rights abuses; Malala is only 16 and still continuing her education. However, like Anna, Malala believes that a pen is a powerful weapon and that education can stop people from falling for ideologies of hatred and violence. Like Anna Politkovskaya, Malala did not call for violence or revenge against those who attacked her. Compassion, tolerance and remaining peaceful were principles that Anna held highly in her life. Malala Yousafzai accepted the award in person at the 2013 Anna Politkovskaya Award ceremony at the Southbank Centre, Purcell Room, Queen Elizabeth Hall. The award was presented by the “British Schindler”, 104-year-old Sir Nicolas Winton who, in 1939, organised the rescue of 669 Jewish children from Nazi-occupied Czechoslovakia, saving their lives on the eve of the Second World War. Malala and Sir Nicholas are also the youngest and the oldest persons ever to be nominated for the Nobel Peace Prize in 2013. Malala Yousafzai receives the 2013 Anna Politkovskaya Award. Written by Malala in collaboration with critically acclaimed author, Patricia McCormick, this children's edition tells the remarkable story of a girl who knew from a young age that she wanted to change the world - and did. Her journey will open your eyes to another world and will make you believe in hope, truth, miracles, and the determination of one person to inspire change. Raised in a once-peaceful area of Pakistan transformed by terrorism, Malala was taught to stand up for what she believes. So she fought for her right to be educated. And on 9 October, 2012, she nearly lost her life for the cause. She was shot point-blank on her way home from school. No one expected her to survive. Now, she is an international symbol of peaceful protest and the youngest-ever Nobel Peace Prize winner. I am moved beyond words to be honoured with this great award. Anna Politkovskaya was a dedicated journalist and human rights activist. She campaigned passionately about issues which concerned her. She spoke out about causes which other people dared not speak about. She was brave. She was an inspiration. I have been very fortunate over recent months to have been given a number of awards from different organisations all over the world. Each one has been extremely special to me in its own way. I am particularly proud to have been chosen to receive an award which bears Anna’s name. I hope that I and many other women may be as brave as she was. I greatly admire Anna’s dedication to truth, to equality, and to humanity. She was a champion for many people who were not able to stand up for themselves. Her desire to help others is a cause to which I dedicate myself. and – all too often – war and conflict. We should be alarmed that in the 21st Century it is now more dangerous to be a woman than a soldier in conflict. This war that is being waged against women, these women who are our mothers, our sisters, and our daughters, needs to cease, and it needs to cease now. The only way this can and will be achieved is through recognizing the impact of conflict on women and girls and by ensuring women and girls are critical to the peace building process. Let us not forget about UN Resolution 1325. In awarding me this prize, you are helping to bring awareness to the world of my cause to which I have dedicated myself. Nothing is more important to me than campaigning for the right to an education. Equipping our women and girls with the tool of knowledge that they need to survive the dangerous terrain upon which they tread, from the very moment they enter this world. Let us grow our army of foot soldiers to fight our jihad through unity, peace, and prosperity. This is the only way we can bring about true harmony in our world today. An eye for an eye only makes the whole world blind. So, I would like to accept this award on behalf of all of the women and girls in the world who are standing up for their rights against a backdrop of violence and intimidation. This is for you my sisters. Individually they do not have a voice. Collectively, and through events such as this one tonight, we may draw attention to their struggle and we may prevail. With the help of others, every girl in the world should have the opportunity to go to school. It is their right. I am just one girl who fought for my right to go to school. Not with guns and bombs – but with my pens and my books. Ultimately, pens and books will win out over guns and bombs. Knowledge will always defeat ignorance. Hope will conquer fear. I was extremely lucky. My family believes in education. My father has campaigned for girl’s rights for many years and he has always supported me in my desire to campaign for education for all children. Others are not so fortunate. Children across the globe are imprisoned by poverty, by fear, by violence or by cultural opposition. It is for them that I continue my campaign. In the United Kingdom, where I go to school now, education is something which is taken entirely for granted. Going to class is a completely normal and expected part of growing up. I want to live in a world where education is taken similarly for granted in every corner of the globe because no-one is excluded from it. 80% of all human trafficking victims are girls. In a single year, an estimated 150 million girls are victims of sexual violence. 70% of the world’s 1.4 billion poor are women and girls. We must work together to ensure that girls are protected, respected and helped to flourish. So, my goal is education for all of the children of the world whatever their colour, their religion, their social status or their gender. The basic right to an education should be denied to no-one. Ladies and gentlemen, I am fortunate that people are aware of who I am because it enables me to campaign on these issues, about which I am so passionate. I have been shown great kindness. I am extremely fortunate. Many other people, no less deserving than me, have done great things to further the cause of education. They are unsung heroes. So, I accept this award for them. I share this award with them. The challenges may be great but – working together – I know that we will succeed. The legacy of Anna may be the bravery which she showed, and which has helped so many other people to find bravery in themselves also. As we approach the seventh anniversary of Anna’s death let us remember a brave lady, who worked tirelessly to help others and who stood for the values of peace and humanity. It is these values which we all share – and which we celebrate in her memory.